Chill Out Jungle Bungalow kohteessa Krabi, Thaimaa: Varaa nyt! Chill Out Jungle Bungalows are nestled in the jungle, below the towering limestone cliffs, just 5 minutes from Tonsai beach you will find our Thai family run bungalows. Each bungalow is uniquely decorated with colourful and funky art work, from all over the world. Our Thai style bungalows have tiled flooring throughout, furnished with a hanging space for your clothes, table and chairs and bedside table. The rooms have mosquito nets on the windows and also over the beds, if you wish to use them. The bathrooms are a mix of Thai western style, with sink, flushing toilet and Thai refreshing cold showers. Every bungalow has its own balcony area, for you to sit and relax and enjoy the nature, from wild monkeys to monitor lizards, whilst taking in the amazing view of the rock face. You can submerse yourself in the tranquility of the tropical jungle but also have peace of mind that should you need anything our reception area and bar is not far away. Our Chill Out reggae bar is all hand crafted from drift wood, with relaxing seating areas and tree top platforms, where you can relax in the evening and watch our infamous fire shows. All the art work you see has been done with care and attention make to make a warm friendly atmosphere that you will experience during your time with us. We are a small community like a family and we welcome anyone to embrace that with us. We have a restaurant on site that offer Thai and international cuisine, food stalls with local dishes, and a mini market, a really lovely coffee bar with handmade coffee. We have a climbing shop and tour desk on site and you are able to book a day of climbing with an experienced climber, who have been climbing the limestone cliffs for years. 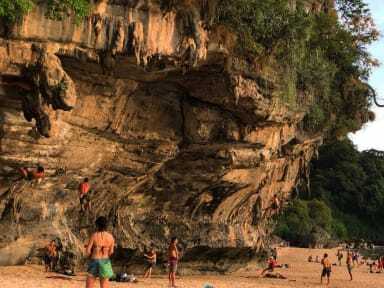 Tonsai and neighbouring Railay beach is famous for its rock climbing which has become increasingly popular in recent years and it is not hard to see why with the towering limestone cliffs. . If rock climbing isn’t your thing then there are still many things to see and do. Diving and snorkeling are very popular in the area and we are also a gate way to many islands, the closest being only half an hour away. 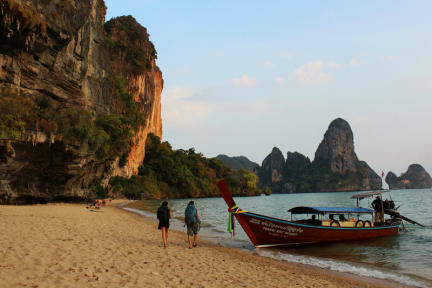 If you prefer to stay closer to home then you can explore neighboring Railay bay with its hidden beaches and lagoons. If you prefer just to relax, then both beaches offer relief from the outside world. We are situated 5 minutes from Tonsai beach and approximately 15 minute’s walk from Railay bay. Reaching us is very easy, take a long tail boat from Ao Nang beach which is the main tourist center over to Tonsai Beach. 5. Reception working hours 09:00-21:00.